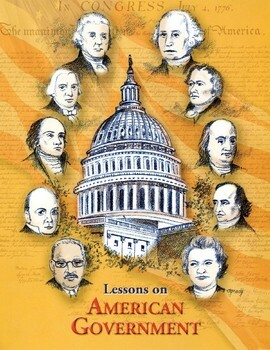 To do an in-depth study of the life and times of an individual associated with American government. Will vary depending on whether students are given class time to work on their report. 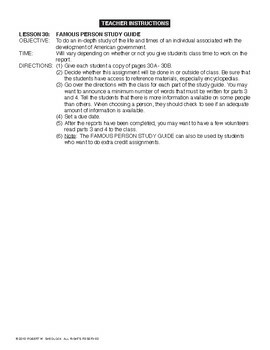 This study guide helps students do research on a famous person associated with American government. It can be used multiple times during the school year. 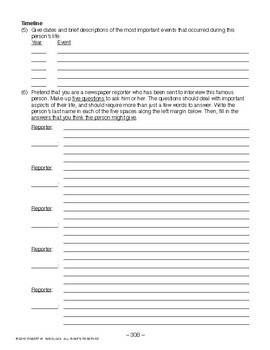 As the teacher, you can decide whether this assignment will be done in or outside of class. Be sure the students have access to reference materials, especially encyclopedias. Tell the kids that there is more information available on some people than others. When choosing a person, they should check to see if an adequate amount of information is available. After the reports have been completed, you may want to have a few volunteers read parts 3 and 4 to the class. These sections require students to give information about the early life of the famous person they chose (before they were famous), as well as their later years after becoming well known. 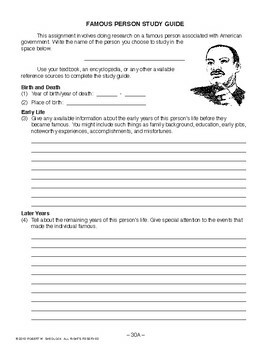 NOTE: This Famous Person Study Guide can also be used by students who want to do extra credit assignments.